Whatever your Budget – We can cater for you Whether you are looking for a budget kitchen or a top of the range kitchen, Peerless will custom build for you. We are a kitchen Wholesaler which means you deal directly with the manufacturer and receive wholesale prices. Peerless Joinery manufactures quality custom kitchens built to specifications as well as other joinery including bathroom vanities, laundry cabinets, entertainment units, home offices, walk in robes and more. We also offer an obligation free design service as well as supply and installation when required. Peerless Joinery has over 25 years experience in the kitchen manufacturing industry. 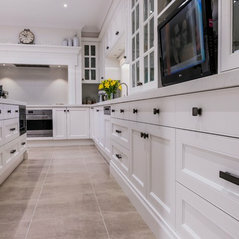 We employ over 20 skilled craftsmen and utilise state of the art computer aided design and machinery ensuring that we can deliver high quality joinery to our clients on time. We provide the following – budget kitchens, cheap kitchens, discount kitchens , kitchen renovations, mid range kitchens and top of the range kitchens. All at Peerless Joinery.